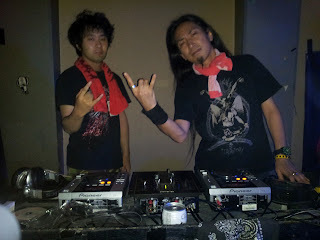 About once every one or two months, death metal bands in Hiroshima host a death metal event called Death Metal Terror, featuring up-and-coming metal bands as well as veteran bands from around Japan. On July 14 was the culmination of these events, a get-together of a bunch of death metal bands around Japan at the Hiroshima Death Fest. I went to the show with my new video camera to film the bands. I also wanted to get in the mosh pit, so I only filmed a couple of songs per band and then I took a break to get my circle pit on. I filmed all of the videos below unless otherwise specified. Death Metal Terror events are hosted mainly by the three local bands, Baked Bomb, Neuroticos, and Blind Hate, and usually one of them will open the show, playing even before young up-and-comers and lesser-well-known out-of-towners. I think it’s a great way to get everyone to the venue to see all the bands. Baked bomb is a great death metal band with an extra string on both guitars and the bass. They have great catchy yet brutal riffs interspersed with solos by each of the guitarists who make the most of their seven strings. The constant guttural vocals of the bass player, Makoto, complete the doom-like sound of this band. They’re all really nice and fun-loving guys. You’ll notice in the video their metal brothers giving them drinks on stage as they play. This is a common scene at Death Metal Terror shows, at once comical and punishing. Still, it does not do anything to take away from the quality of their performance, a testament to their professional playing level. These guys were fun to talk to after the show as well. Makoto is always actively reaching out to non-Japanese speaking audience members who came to see the show and making them feel welcome. This was my first time seeing this band, so I didn’t know what to expect, so I was very pleased to see this band with thrashy riffs, a black-metal face painted vocalist that danced around the stage and into the crowd constantly, a giant gong placed in the middle of the crowd, and good beats and fun the whole time. Fun and friendly guys on and off stage, I recommend seeing this band if you want to have a good time. I didn’t know what to expect from an all-girl masked death metal band from a corner of Japan not known for metal (as far as I know anyways), but these girls really know how to tear it up. Unforgiving and brutal metal, I hope to see this band again sometime! 3 out of 4 members of this band are Brazilians based in Hiroshima, and they are proud of their Brazilian metal heritage (see: Krisiun, Sepultura). I love this band’s sound, so brutal, in your face, it gets the crowd moshing every time. They are working on recording new music, some of which they played on this night. They put up a new track on youtube, give it a listen below. When I heard Desecravity’s recorded music for the first time on Youtube, my jaw dropped. So much brutal technicality shoved into one song. When I saw them live for the first time, my jaw dropped again. Such an awesome performance. The video above doesn’t quite do them justice. I will be seeing them again when I get the chance. The guitars and drums are amazing, but I want to give a special mention to the bassist, who, in addition to moving his fingers constantly across the fretboard, is quite handsome. Check him out up close in the video above. This band seems to be getting some attention abroad as well! I will definitely be following these guys. Another band to which words can’t do justice. If the words “metal” “death” “gore” “grind” “awesome” “fast” mean anything to you go get this band’s recordings, listen to their myspace, watch their videos, read about them on Metal Archives, do something. I seriously I thought I would die (happily) during their performance. I don’t really know too much about the band, but there is something awesome about the fact that they use sound clips of horror movies in Spanish and that they have toured Mexico. It was really great to be able to see this thrash/death band at the fest. They are pretty awesome and I hope to see them again. In the video above you can see the reunion of the bald metalheads of the night. Good times all around. This death metal band has an awesome sound and stage presence. 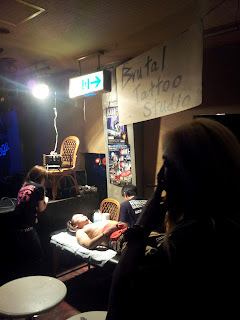 They often host metal shows called “Dead in Horror” in Fukuoka. I highly encourage you to check them out if you’re in the area. This like this death metal band more every time I see them. The crowd is always into them and they are really great guys. Thanks for the awesome show!